Located just minutes from Pomona Fairplex and Ontario International Airport, Claremont is a popular place to stay for those visiting the greater Los Angeles area, the Inland Empire, and Auto Club Speedway. Staying in Claremont allows travelers time to exhale. Guests can walk or bicycle to the city’s day spas and salons, locally owned boutiques, galleries and works of public art, seven nationally renowned colleges, and more than 80 pubs, grills, sandwich shops, bakeries, and fine dining restaurants. Catering to couples, families, and business travelers alike, accommodations in Claremont range from economy to upscale. 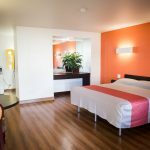 For budget-minded tourists looking for an affordable place to stay near Interstate 10, there’s Claremont Lodge, Knights Inn Claremont, and Motel 6 Claremont, which offers weekend tennis packages. For those seeking chic lodging, there’s the luxury boutique hotel, Hotel Casa 425, in the Claremont Village. And on Historic Route 66, there’s the resort-like DoubleTree by Hilton Hotel Claremont, which houses a conference center and offers additional amenities and suites for business travelers. Both hotels feature uniquely styled rooms and top-notch dining. Browse the places to stay in Claremont below to find the best accommodations for your traveling needs.